Is the dreary jobs outlook the reason we are pessimistic about our kids’ future? Why are Americans so pessimistic about their children’s future? Some 63% of all Americans said most children in the U.S. won’t be better off than their parents. This dour view comes despite most respondents, 54%, feeling they are better off than their own parents. This is a “stunning reversal from CNN data at the end of the last century (1999 to be exact) — when two thirds of Americans predicted that children would grow up to have it better than their parents”. Some key factors seem to influence this pessimism. The vast majority of Americans have higher incomes than their parents, but that’s in large part because most families have two earners now, she said. Only half have more wealth, she said. Meanwhile, the savings rate is low and unemployment is high. College costs are rising faster than inflation and student loan debt is exploding. But income mobility “has not changed significantly over time”. 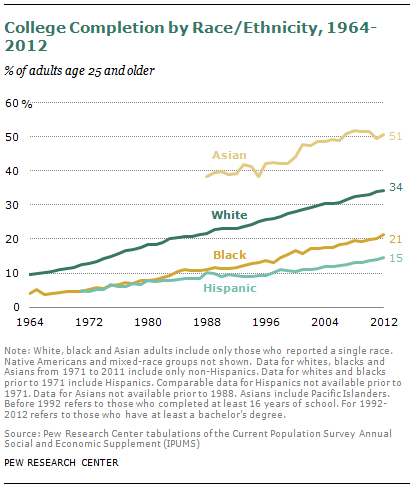 And college completion rates have continued to increase over the long term. I agree with the majority view, and the bleak jobs picture is a primary reason for my pessimism. Although the latest jobs report showed that payroll numbers have finally returned to pre-recession levels, there is a negative side to this news. As good as that might sound, surpassing the previous high-water mark in terms of payroll employment is cold comfort for recent graduates and other new entrants into the work force, as well as for the legions of Americans who lost their jobs in the Great Recession. While payrolls may be back to where they were before the downturn, the working age population has risen by roughly 15 million over the same period. According to one calculation, the country still needs a “whopping 7 million” jobs to accommodate the needs of a healthy economy. The outlook is dreary. At a rate of 217K per month with 150K needed to keep pace with population growth, how long will it take us to catch up to that 7 million? Oh …. eight years and nine months. Meanwhile, American “women are having fewer kids, and demographers don’t know why”. Perhaps this lowered fertility rate is partly a consequence of the pessimism expressed by the latest poll. Paradoxically, lower birth rates could be exacerbating the downhill slide of our economy. The consequences of America’s recession baby bust are already significant. “We’re getting to the point where it’s dropped far enough and for a long enough period of time that it’s going to have serious implications” for the population and the economy, Mather said. With declining fertility, the U.S. population would age, and ultimately the labor force would decline as older workers retire — a trend already well underway with the Baby Boom generation reaching their mid-60s. The financial crisis “has had the most punishing impact on demographic trends of anything since the Great Depression,” Johnson said. Perhaps the jobs crisis is fundamentally transforming our nation, but in ways that were not foreseen. Tami Luhby, “The American Dream is out of reach”, CNN, June 4, 2014. Nelson D. Schwartz, “217,000 Jobs Added, Nudging Payrolls to Levels Before the Crisis”, New York Times, June 6, 2014. David Leonhardt, “‘The Great Shift’: Americans Not Working”, New York Times, August 27, 2013. Joseph Lawler, “Women are having fewer kids, and demographers don’t know why”, Washington Examiner, June 7, 2014. Ed Morrissey, “May jobs report: 217K jobs added, jobless rate steady at 6.3%”, Hot Air, June 6, 2014.